(f) the corrective steps taken by the Government to make available quality homeopathic medicines? 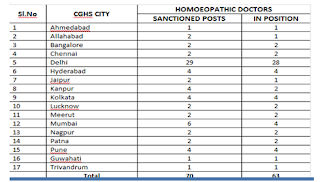 (a) The number of homeopathic doctors working in the CGHS Homeopathy Dispensaries in the country is shown at Annexure. 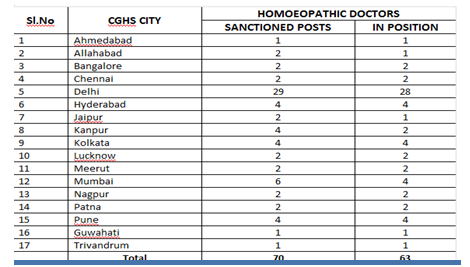 (b) No; There are no specialists in homeopathy under CGHS. (c) No; CGHS homeopathic formulary includes 1008 generic and 9 special preparations. Essential non-formulary medicines are indented against individual prescriptions. (d) & (e) No; there is no proposal to include German made homeopathic medicine in CGHS dispensaries as they are not part of formulary. However, essential German made homeopathic medicines are made available through local purchase to the beneficiaries, when Indian made medicines of same therapeutic indication/ingredients are not available with CGHS. The lab analytical report of each batch of medicines from the NABL accredited laboratory is enclosed. The medicines conform to the Homoeopathic Pharmacopeia of India (HPI) quality standard. If any parameter of the batch supplied is found not matching with the HPI quality standard, the sample of the same is further tested from the Govt. Homoeopathic Pharmacopeia Laboratory (HPL) and accepted only if passed in the drug test. No substandard medicine is accepted by the CGHS Homoeopathic Medical Store Depot (HMSD).